….a world with its own history, rules and prisons, that is reaching into our world explosively. When Jack West Jr won the Great Games, he threw the four legendary kingdoms into turmoil. Now these dark forces are coming after Jack in ruthless fashion. 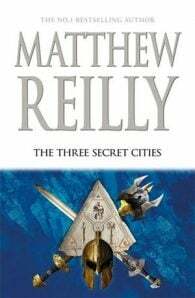 With the end of all things rapidly approaching, Jack must find the Three Secret Cities, three incredible lost cities of legend. It’s an impossible task by any reckoning, but Jack must do it while he is being hunted by the greatest hunters in history.